He’s been going to Scouts for over a year now and it’s the one thing that he wants to go to nearly all the time – he looks forward to it. They do some good stuff at Scouts which is probably one of the reasons, or the main reason, that he enjoys going. One of the things they did recently was learn how to iron so ever since then he’s been nagging me to iron something. Last night I finally had the time to supervise and got out three things for him to do – two skirts and a blouse – nothing that he could really wreck. 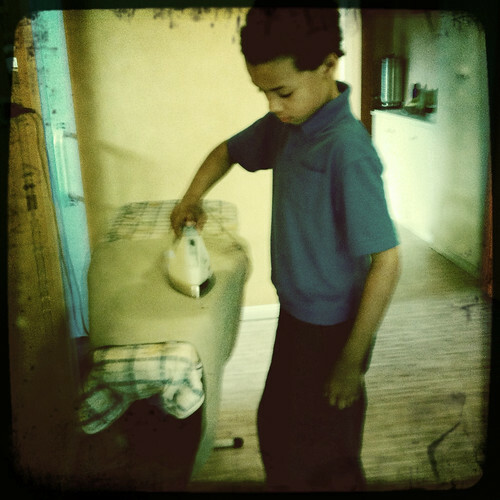 Luckily I did supervise because they mustn’t have told him never to leave the iron face down on the ironing board. Luckily my skirt escaped unscathed. I had to go over a couple of things but he got most of the wrinkles out. He even had the nerve to complain that I gave him three things to iron. I could have given him a lot more. Not sure how long this eagerness will last but I’d better milk it while it’s there I think.